In Part 1, Part 2 & Part 3 of this series, we have conclusively shown that some of the outer space pictures (Apollo-Soyuz et al.) that were allegedly photographed by Meier during his 5-day 'Great Space Journey' on July 17, 1975 are "forgeries" that have their source in educational space documentaries from the USA & USSR which were broadcasted around the world in 1960's & 70's. In Part 1, we have documented Kal Korff's analysis of the Apollo-Soyuz docking photos which he first published in his 1981 (again in 1995) book. In 1988, retired Research Professor Emeritus (OSU), James W. Deardorff wrote a review (unpublished, 20 pages) of Korff's 1981 book with the title - Review of Korff's Report: "The Meier Incident -- The Most Infamous Hoax in Ufology". "Regarding Meier's reported 5-day trip during which he said Semjase permitted him to photograph the Apollo-Soyuz link-up in 1975, one of Korff's objections (p.28) is that the Soyuz spacecraft had straight solar panels extending outward, not partially folded ones as in Meier's photo. This information was said to have come from William Drews of NASA. However, if one reads the Soviet account of this link-up25 one can see from the main drawing that the Soyuz solar panels are pictured to have been in a partially folded orientation, as in Meier's photo. The drawing was made by one of the two astronauts who was on that flight: Alexei Leonov, who is also an amateur artist. 25 Lebedev, L., and Romanov, A., Rendezvous in Space: Soyuz-Apollo (Moscow: Progress Publishers (in English), 1979) p. 10." S75-25077 (May 1975) --- A photographic copy of a painting made by cosmonaut Aleksey A. Leonov, commander of the Soviet ASTP first (prime) crew. This symbolic artwork, representing a Soviet Soyuz spacecraft docking in Earth orbit with an American Apollo spacecraft, was finished in May 1974. The sketch for the painting was made in 1973 following the signing of the space agreement between the United Stated and the Soviet Union. Leonov said that his painting symbolizes the new type of international cooperation of working together in space. The original painting, which measures 80 centimeters by 160 centimeters (1 cm. = 0.39 in. ), is on display in a museum in the city of Baku on the Caspian Sea. In making the sketch for the painting Leonov used a model of an earlier Soyuz spacecraft and a picture of an Apollo spacecraft. Later, he obtained a model of an Apollo which helped him check the configuration of the American spacecraft. The tanks on the Docking Module are no longer exposed on the current DM configuration, he noted. Also, this would not be an exact view of the sun as seen from Earth orbit. Leonov took artist license in stressing the symbolism in his artwork. The Soyuz is represented smaller in the painting than it actually is, Leonov added. Cosmonaut Alexei Leonov whom Deardorff referred to, acknowledged himself (see above photo description) that the model of Soyuz which he used for his painting was an old model and not the "latest" one that went up in space in July 1975. For older versions of Soyuz, please refer to this, this and this website. We have also touched up on the differences between Meier's and real Soyuz spacecrafts in Part 1 and Part 2 of this series. The above video - Apollo-Soyuz Test Project Facts, Part C - contains the raw footage of Apollo-Soyuz docking from 1975. And from that footage we can notice that the solar panels of Soyuz were straight and always stay fully extended during the docking procedure. Leonov also acknowledged (see painting description) that the size of the Soyuz in his painting is smaller than the one in reality. Leonov further noted that the configuration of Apollo's docking module (DM) which he painted is different to the real DM. Please refer to Part 2 (search for the word 'tanks') on this subject. All of the above reasons clearly indicate that the Soviet Cosmonaut Leonov's painting made in 1973/1974 is technically incorrect, as it was made before the final design was finished. And the painting of Apollo-Soyuz docking was only made as a symbolic artwork to illustrate the international cooperation of working together in space. All it takes for Deardorff, to acknowledge the results of Korff's analysis and recognize that the Soyuz in Meier's pictures as not the real Soyuz but from a NASA animation, is just to look at one, just one real NASA photograph of a real Soyuz spacecraft. Perhaps he did or perhaps not; but citing just one source, which in reality is only a "symbolic artwork", seems to be a perfect example of confirmation bias. Note: James Deardorff towards the end of 1990's still stood by his reference to an artwork by Soviet cosmonaut Leonov. I am not sure, whether or not he has noticed his mistake in later years. After uncovering the fake photos in Meier' collection which are also being published in FIGU books as genuine; I shared my analysis with Billy Meier and wanted to hear his response. Following are the questions (from me) posed to Meier on the FIGU Forum and the corresponding answers (by Meier, in green color). 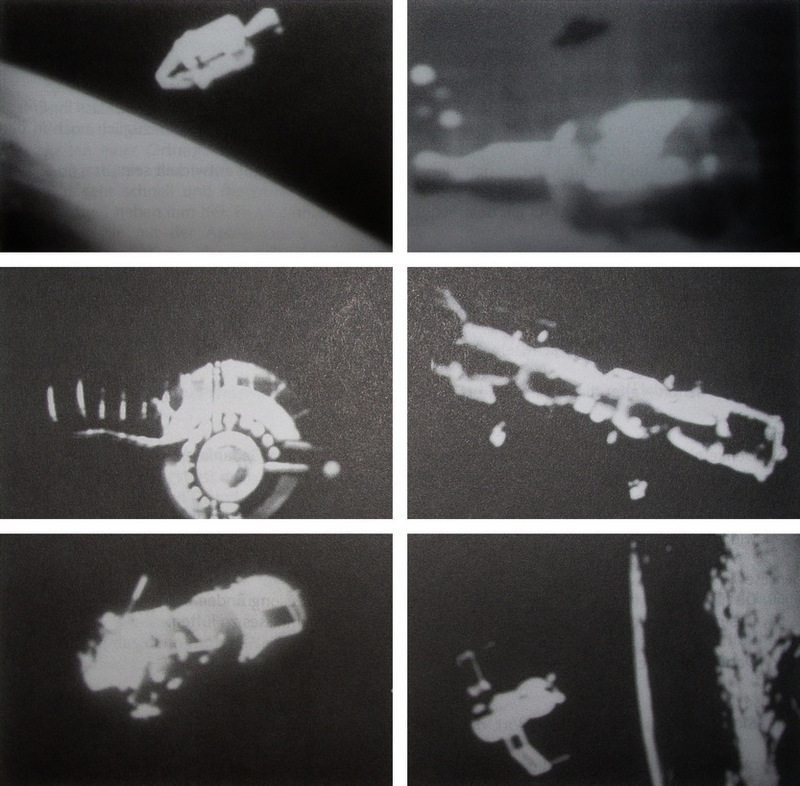 Are all the 6 different photos in the above illustration come from Apollo-Soyuz docking on July 17, 1975 ? Or do some photos in those six, not belong to Apollo-Soyuz docking ? We don’t know because Billy is not in possession of the original slides/photos anymore. When I recently looked into some of the Apollo-Soyuz pictures & others that were published in Guido's 'Und sie fliegen doch!' & also in CR 31 (PPKB 1), I found that 11 outer space pictures are certainly falsified and have been traced back to NASA animation (early 1970's), Russian documentaries (1969 & 1972),..etc - all of which were produced before your Great Journey in July 1975. Some pictures are of spacecrafts that were not even in space during your Great Journey. For example Salyut-1 in your photos was from a frame of a documentary made in 1972 and the Soyuz 4-Soyuz 5 coupling photo was from a frame in a documentary made in 1969. 1. Would there be any explanation (by you or/and Plejaren) on this discrepancy, just like the explanations which were given in earlier times on similar anamolies - Asket-Nera, Universal Barrier, WCUFO,..etc ? There’s no need for a “correction”. "There’s no need for a “correction”. (Note by CF: Actually, these pictures are not an important issue. They were used in the PP Block only as an illustration.)" Why do you think there is no need for correction ? Do you still consider these photos as authentic, photographed by you during your space journey ? If not, why publish the pictures, faked by MIB in PPKBs as authentic ? CF*, these pictures were checked & authenticated by Ptaah. I still don't understand what you meant by this: "They were used in the PP Block only as an illustration." If FIGU is fine with having faked pictures in its publications, why did they remove the Venus, Jupiter, Pterdactyl, Asket-Nera (captions changed),..etc ? Why not just have them in photo albums & just say what you have just said ? Billy’s comment: This is old hat. The above Q/A suggests that Billy Meier either still thinks these pictures - which we have analysed in Part 1, Part 2 & Part 3 and shown to be from NASA and Soviet space documentaries from 1960's & 70's - are genuine or he doesn’t care anymore whether or not they are genuine as it can be noticed from his evasive responses to the questions pointing the obvious contradictions that have come up. Following is the correspondence between me and Christian Frehner, FIGU Core Group member and SSSC Facility Director. The following is the Q/A on english FIGU forum and your response. I am going to just focus on your response. 2. Would these pictures be removed entirely or would they be published as-it-is which would give the obvious message that they are genuine ? (Note by CF: Actually, these pictures are not an important issue. They were used in the PP Block only as an illustration.) "
CF, these pictures were checked & authenticated by Ptaah. I didn't understand what you meant by this: "They were used in the PP Block only as an illustration." Does this mean that you acknowledge them to be fakes ? But simple logic dictates that - some of the spacecrafts (Soyuz 4, Soyuz 5 and Salyut 1) were not even in space during July 1975. How can you use them as Illustration when they don't even exist in space ? I guess that you already read Billy's comment in the forum. Of course I have read Meier's response which is: "There’s no need for a “correction”. Which clearly skirted the main question, which is - does Meier acknowledge that the Apollo-Soyuz outerspace pictures as fake or not ? If Meier acknowledges them as fakes made by MIB and yet says there is no need for a "correction", then it raises further ethical & logical questions, which I am not going to raise here. Obviously a lot of contradictions raise from your response. Hope you respond to all of them. These outer space pictures were checked & authenticated by Ptaah (FIGU Special Bulletin 20, 2005) as genuine pictures taken by Meier and not as illustrations. How do you explain this ? If it is just used as illustration purposes, then why was it not mentioned in the contact blocks that they were just there for illustration ? Instead they give the clear message that they were real pictures taken by Meier. Again illustrating what exactly ? Simple logic dictates that - some of the spacecrafts (Soyuz 4, Soyuz 5 and Salyut 1) were not even in space during July 1975. How can you use them as Illustration when they don't even exist in space ? Of course I have read Meier's response which is: There’s no need for a “correction”. Ptaah said (PP Block 10, page 17: "These are only a few examples of the genuine 42 pictures, at which only a few falsifying and not very important changes were made." In other words: These are not the original photos, but photos which look similar to the original ones. They are still falsified photos. Logically, falsified and/or altered photos cannot be the original ones. As you can read from my explanation above: Ptaah is stating that these are a few examples of the 42 genuine photos, but which do not correspond 100% with the original photos. Since these photos were not published in the Semjase-Blocks (yellow and brown editions), and since they are not 100% identical with the original photos (according to Ptaah's statement), I look upon them as illustrations. They cannot be taken as proof. "1. Ptaah said (PP Block 10, page 17: "These are only a few examples of the genuine 42 pictures, at which only a few falsifying and not very important changes were made." In other words: These are not the original photos, but photos which look similar to the original ones. They are still falsified photos. Logically, falsified and/or altered photos cannot be the original ones. 2. Ptaah is stating that these are a few examples of the 42 genuine photos, but which do not correspond 100% with the original photos." Yes these falsified photos, technically cannot be called as original & 100% authentic ones because Ptaah said that they were falsified in CR 384, PPKB 10 which is also published in FIGU Special Bulletin 20. "..only slightly falsified by Schmid, whereby the aforesaid falsification, for a logical reason, found no use"
"..only very few falsifying and not any major changes were made." Ptaah clearly says that these pictures are only very slightly falsified with no major changes at all. He also clearly says that this falsification found no logical use at all - meaning that most of the ORIGINAL content photographed by Meier still exist in these 42 outer space photos. Do you agree with this logical conclusion ? These are Hans Georg Lanzendorfer's words, not Ptaah's. It's an interpretation of what Ptaah said in PP Block 10 on page 17. The first sentence as you said, is made by HGL but the second sentence is made by Ptaah himself. Are you suggesting that HGL's interpretation is wrong ? Below, I will explain with 2 reasons why HGL's interpretation of Ptaah's words is technically correct. "..Of the more than 1,378 pictures from your Great Journey, only a few remain, namely 42, which really came from you.."
"..Worldwide, none of your dinosaur pictures and space pictures, etc. have been published, other than those that are shown in new Contact Report Block. These, however, are only a few copies of the real 42 shots, to which only very few falsifying and not any major changes were made..."
HGL: "..only slightly falsified by Schmid, whereby the aforesaid falsification, for a logical reason, found no use"
The falsification found no use because the major part of these outerspace pictures which really came from Meier were untouched (except the few parts of these outerspace pictures), thereby keeping the integrity of the picture intact. Moreover, Meier showed HGL's article to Ptaah, which he read and agreed with it, without mentioning any modifications to the article. This obviously means that the truthfulness and the accuracy of the content in it was acknowledged by Ptaah. If you still think that HGL's interpretation is incorrect, then please ignore it as my below question is framed based on just Ptaah's above two verses, presented under Reason #1. Ptaah from the above two verses, clearly means that the 42 Outer space photos (ex: Apollo-Soyuz, Cave men,..etc), most of which are published in PPKB 1 & 2, really have come from Meier. And moreover in these photos, no major changes or falsifications were made. This logically means that, the major part of the content in these outerspace pictures published in PPKBs must be GENUINE & only a minor part of the content in these outerspace pictures, can be traced back to FALSIFICATIONS attempted by the alleged MIB/photgrapher Schmid. Do you agree with this conclusion ? case remains unsolved. I for my part can live with the situation. Based on what is written in the PP Blocks and in the FIGU Bulletin I can understand that you have come to this conclusion. Christian, may I know why you seem to be avoiding responding to the simple questions directly ? My question to you was based on Ptaah's own words. It is the only conclusion any rational person can reach at. And I have just asked you, if you agree with it or not ? One would expect the answer as either YES or NO or I DON'T KNOW, along with reasons. But there remains the unsolved question of how reality looked like, i.e what exactly has been falsified. I am very much surprised that again you are asking the same question even after you were sent my analysis (see the attachment) 3 months ago on August 20 by Simon, where the side-by-side comparison between the pictures of Meier and the ones from NASA animation and other documentaries are presented. My research (short version), presented in that document, clearly shows that Meier's outerspace pictures that have been analysed by me, are not 1% or 10 % or 90% falsified as you seem to be supposing but 100% falsified. In other words, the alleged Meier's original outerspace pictures were switched with those that come from NASA animation, other documentaries & magazines. This makes me wonder, whether you have read the document at all in the first place. If you haven't, then may I know the reason for not reading it ? If you have, then may I know the reason why you still refer it as - "the unsolved question of how reality looked like, i.e what exactly has been falsified" - when I have shown that they are 100% falsified ? What are your objections on my research ? And since neither Ptaah nor Billy want to discuss this issue any further, this case remains unsolved. I for my part can live with the situation. Beauty of Truth is that Logic & Evidence speaks for itself and requires nobody's help. In this case the analysis clearly shows that they are 100% falsified, i.e. the alleged Meier's outerspace pictures have been switched with pictures from TV showing NASA animation, other documentaries and magazines. We really don't need Meier's or Ptaah's confirmation on it. I would still like to hear from you as to why we need only Meier or Ptaah to tell us how much falsification was made in those pictures ? If Meier/FIGU knows that some pictures are clearly fake, would they then publish these fake pictures in books as genuine ? If the answer is NO, then there is every reason for Meier/FIGU to look at the analysis (see attachment) and take necessary action. Again just like Meier, no direct answers to simple, straightforward questions by Christian. This correspondence suggests that Christian Frehner didn't spend enough time or no time at all (implying zero interest) to go through our analysis which proves beyond the shadow of a doubt that the Apollo-Soyuz et al. pictures published by Meier couldn’t have been photographed by him of the real craft in space.